23 May 2017. A small plastic chip device that acts as a model of a human airway simulated a severe asthma exacerbation or attack caused by a viral infection. A team from Emulate Inc. in Boston that developed the device with the pharmaceutical company Merck, also in Boston, described its findings in a paper presented today at a meeting of the American Thoracic Society in Washington, D.C.
Airways are the tubes that carry air in and out of the lungs. Asthma is chronic condition, where the airways become inflamed and narrow, causing people with asthma to experience wheezing, shortness of breath, tightness in the chest, and coughing for periods of time. Among asthma’s underlying causes are infections, pollutants in the air, and allergies to pollen, molds, or dust mites that trigger airway inflammation. Centers for Disease Control and Prevention estimates that in 2010 some 18.7 million adults had asthma, along with 7 million children. Emulate Inc. is a spin-off enterprise from the Wyss Institute, a biomedical engineering research center at Harvard University, developing simulated human organs for lab research and drug testing. The company often commercializes basic research done by the Wyss Institute, including in this case a simulated human airway. 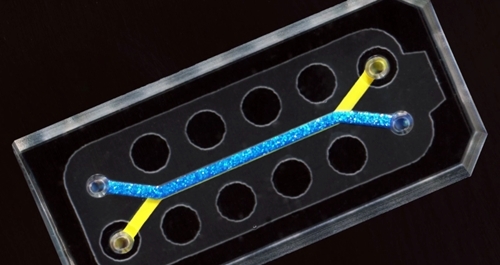 As reported in Science & Enterprise, Wyss Institute researchers developed a prototype chip device having fine fluid channels lined with cells from human airway epithelium or surface layers, as well as specialized cell types. The company advanced this prototype in partnership with Merck as a model for testing drugs for airway-related disorders, such as asthma and chronic obstructive pulmonary disease, or COPD. In their paper, Emulate Inc. president and chief scientist Geraldine Hamilton and colleagues report on simulation of severe asthma exacerbations brought on by viral infections, in this case human rhinoviruses responsible for most common cold symptoms. Among people with asthma, however, rhinoviruses are a leading cause of exacerbations, both for children and adults. In their study, the Emulate-Merck team infected with rhinoviruses an Emulate Inc. small airway-lung chip induced with asthma. The surface layer cells responded with characteristic inflammation, and release of cytokines or signaling proteins associated with inflammation. These reactions also recruited neutrophils, or white blood cells in the immune system leading to leakage across the surface layers. The neutrophil reactions suggest that drugs blocking the actions of specific signaling proteins associated with airway inflammation could treat the reaction. Merck makes a drug code-named MK-7123 that blocks one of these signaling proteins, CXCR2, and controls neutrophil activity affecting inflammation in the airways.